Applying a little thematic style to the world of high-end soccer collecting, 2016-17 Panini Noir Soccer debuts with a limited mix of premium cards. Each box contains at least three autographs and two relic cards. Even with a pricey format, 2016-17 Panini Noir Soccer still incorporates a 200-card base set with two versions to collect. Each featuring a different player image, collectors can find Black and White along with Color base cards for all 100 subjects. 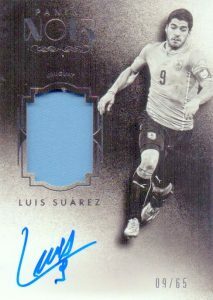 Mirroring the dual-format of the base set are the many hits of 2016-17 Panini Noir Soccer. Signed cards showcase hard-signed content from some of the biggest global stars. Standard autographs include Club Signatures, with players from over 15 key teams like Real Madrid and Bayern Munich, as well as Country Signatures and Legendary Signatures. Adding a relic swatch, Autographed Memorabilia includes on-card signatures and patch pieces for top players with both color and black-and-white editions. There are also Prime parallels. Averaging two per box, unsigned relics include the Dual Memorabilia inserts. 2016-17 Panini Noir Soccer Spotlight Auto Card BGS 8.5 Autograph 10 Neymar Jr.
200 cards. Serial Numbered #/75. PARALLEL CARDS: Platinum #/10 (B&W only), Gold #/10 (Color only). PARALLEL CARDS: Prime #/25 or less, Tags #/3 or less. PARALLEL CARDS: Platinum #/10 (*No card #17). PARALLEL CARDS: Bronze #/49 or less, Prime #/25 or less, Prime Tag 1/1. PARALLEL CARDS: Bronze #/49 (*Cards #4 - #/15, 33 - #/35), Prime #/25 (*Card #4 - #/3), Tag 1/1. Shop for 2016-17 Panini Noir Soccer hobby boxes on eBay. 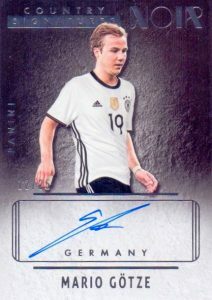 2016 17 PANINI NOIR SOCCER HOBBY BOX - 3 AUTOS 2 MEMORABILIA! !